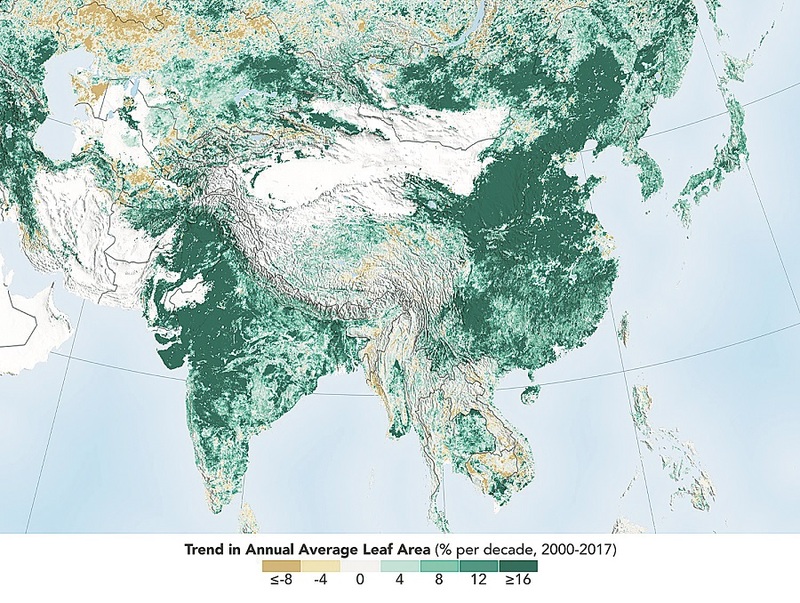 There has been an increase in leafy coverage equivalent to that of the entire Amazon rainforest between 2000 and 2017, especially in China and India, according to a new study. The planet's two most populous nations are leading the increase in greenery in large part due to China's ambitious programs in tree planting and more efficient agriculture practices, said a study by NASA, published on Monday in the journal Nature Sustainability. The study revealed that one third of the planet's vegetated land area is greening, while just 5 percent is browning. This translates to a net increase in leafy area of 2.3 percent per decade, or 5.4 million square kilometers of new leafy coverage from 2000 to 2017. China alone accounts for a quarter of the global net increase despite having only 6.6 percent of the world's vegetated area. About 42 percent of the greening in China comes from forest conservation and tree planting campaigns as the country makes efforts to address soil erosion, air pollution and climate change. Agricultural lands contributed a further 32 percent, it said. India comes in second with a contribution of 6.8 percent of the global rise, added the study, which is based on high-resolution data records from NASA instruments orbiting the Earth on two satellites. China and India account for one-third of the greening, but contain only 9 percent of the planet's vegetated area — a surprising finding considering the general notion of land degradation in populous countries from overexploitation, Chi Chen, a researcher at Boston University and lead author of the study, said in a NASA statement. The study is endorsed by China's official data of forest coverage growth. The country's forest coverage rate has increased from 12.5 percent in the early 1950s to about 21.7 percent in 2017, and its top forestry authority has vowed to further promote the rate to 26 percent by 2035. In 2018, China planted trees across about 106 million mu (7.1 million hectares) of land. China has garnered acclaim after NASA posted the study on its official Twitter account on Tuesday. "Well done! China," commented one netizen. Another said: "China is planting a lot of trees to prevent desertification, and those projects are going quite well! Hope we work together to make it a better world." "I've read that both China and India have been trying really hard when it comes to the environment. Kudos to them," said another netizen. China and India have achieved significant increases in food production thanks to multiple cropping practices, where a field is replanted to produce another harvest several times a year and which also contributes to an increase of leafy area coverage, NASA said. How the greening trend may change in the future depends on numerous factors, both on a global scale and at the local human level. For example, increased food production in India is facilitated by groundwater irrigation. If the groundwater is depleted, this trend may change, it said. It also emphasized that the greening phenomenon doesn't make up for negative impacts on the planet's ecosystems elsewhere.